Telecoms equipment firm Marconi has agreed to sell the bulk of its assets and its name to Swedish firm Ericsson in a deal worth about £1.2bn ($2.1bn). The deal will see Marconi's telecoms equipment business bought by Ericsson, leaving the UK firm with its services business, which will be renamed Telent. Some 6,670 Marconi staff will move to Ericsson, but the Swedish firm warned that job cuts were "unavoidable". 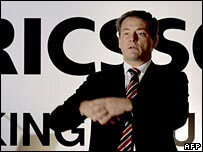 It said 1,000 jobs were at risk at Marconi's sites in the UK and overseas. Ericsson said the deal would help it to meet the growing worldwide demand for mobile and fixed broadband internet access. As a result of this demand growth, telecoms networks will have to be upgraded to increase their transmission capacity, and Ericsson said Marconi's strength in optical systems would help growth. Carl-Henric Svanberg, chief executive of Ericsson, said the deal had "a compelling logic and is a robust financial case". Jean-Charles Doineau, research director at telecoms analysts Ovum, said the deal was all about network convergence. "Buying some of Marconi's assets, Ericsson complements its product portfolio in areas which will be of a very strategic importance for mobile operators and for convergent network operators," he said. Marconi's future has been in the balance ever since it missed out on a major BT contract earlier this year. In April, Marconi had warned that it would lose out on £50m when it was announced that BT had decided not to select it as one of eight companies to work on a £10bn upgrade of its network. After failing to secure the BT contract, Marconi carried out a strategic review of its options. This led to the closure of the group's Edge Lane plant in Liverpool. 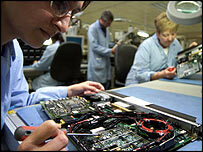 Marconi currently employs just over 9,000 staff worldwide. Of these, about 2,000 workers - nearly all in the UK - will be retained in the Telent business. The deal with Ericsson will see an injection of £185m into Marconi's pension plan to protect the members' rights. An additional £490m will be retained in an escrow account for the potential benefit of the plan. Mr Svanberd said the deal had "compelling logic"
"Over a period of several years, we have had conversations with a number of potential partners regarding the necessary consolidation in our industry," said Marconi chairman John Devaney. "In Ericsson, we have found a partner that has the scale and global reach to take our equipment business forward in a way that we would not have been able to do alone." The deal with Ericsson is the latest chapter in the story of Marconi's decline. The firm has its roots in GEC - the cash-rich industrial giant which was built up by Lord Weinstock. However, after Lord Weinstock left the company in the 1990s, the firm sold off its defence assets and changed its name to Marconi as it attempted to become a major player in the telecoms market. Unfortunately, the transformation, which saw the firm borrowing heavily to fund an acquisition spree, came just as the telecoms boom was coming to an end, leaving it with heavy debts and overvalued assets. Faced with debts of £4bn, the firm was forced into a debt-for-equity swap - asking its banks to accept shares because it could not repay its bills - which left existing shareholders with just 0.5% of the company. The restructured company had been showing signs of recovery, but missing out on the BT contract proved to be too big a blow.